AD4 ECAT MiniModule Series Type OG / IG | CSM Products, Inc. This module series provides high-precision bipolar sensor excitation, adjustable per channel from ±5 to ±15 V DC and suitable for a wide range of sensors. The wide and adjustable measurement range from ±1 V to ±20 V (Type IG) and ±5 V to ±90 V (Type OG) covers a large variety of applications. MiniModule AD4 OG10 is perfectly suited for multichannel applications up to 10 kHz per channel. 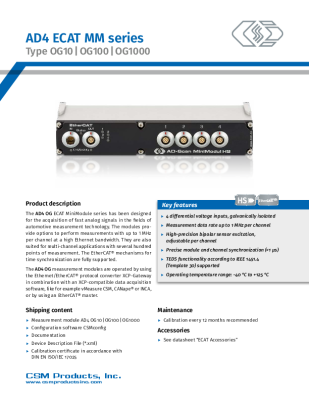 MiniModule AD4 OG100 allows the acquisition of signals with measurement data rates up to 100 kHz per channel. MiniModule AD4 OG1000 for precise analysis of high-frequency signals with measurement data rates up to 1 MHz per channel. Ideal for the precise, dynamic and synchronous detection of fast signal transitions in combustion engines, their electrical auxiliary systems or electric drives and the high-resolution detection of error sources. The MiniModule AD4 IG100 with a measurement range from ±1 V to ±20 V allows the acquisition of signals with measurement data rates up to 100 kHz per Channel. These modules are operated via CSM’s Ethernet/EtherCAT® protocol converter XCP-Gateway in combination with XCP-compatible data acquisition software. 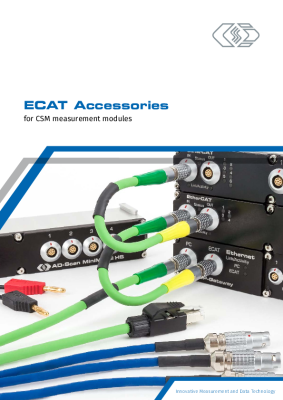 Alternatively, the modules (EtherCAT® slaves) can be run by using a standard EtherCAT® master with measurement data rates up to 10 kHz.